The Smooth 6.75 treadmill is another new entrant in the mid-priced treadmill category from Smooth this year. And just like other Smooth models, expect to also get excellent value for your money with this machine. If you are looking for a folding mid-priced treadmill that would give you more bang for your bucks, then this machine should definitely be on your list. It comes with all the basics that you will need to get an excellent workout. It features a powerful motor, sizeable running area, extra long warranties and lots of features. Just like other Smooth treadmills lately, the Smooth 6.75 also features the deluxe sound system with speakers. With it, you can attach your iPods®/ MP3 player, CD player or other audio device to the auxiliary input jack and be entertained by your own soundtrack while working out. The Smooth 6.75 comes with a 3.0HP continuous duty motor. This powerful motor can provide speeds that can reach 12mph and has 15 levels of incline so it doesn’t matter whether you’re a beginner or a seasoned runner, this machine will give you the workout you're looking for. The 20” x 60” Whisper Weave™ treadbelt provides enough running space for you to move and be comfortable during workouts. It is long enough to accommodate people that are tall with long strides and wide enough for those that are heavy with a maximum user weight of 350 lbs. Also, when not in use, this machine can be easily folded and wheeled away for storage with its dual stage, soft drop folding feature. The Smooth 6.75 treadmill, just like other Smooth models, also features the Im-pression shock absorption running deck. This running deck reduces the impact of running and walking to protect your muscles and joints from injury. There are 12 preset workout programs included in this machine to give you the variety you need to avoid boredom. There is also a heart rate control workout that comes with a wireless belt and transmitter which can adjust the intensity of your run depending on how you set your target heart rate. Plus, the large dual color LCD console shows you your speed, distance, calories, time, incline and heart rate control so you can always monitor your workout progress. Other features include the handrail toggle switch so you can easily change the speed and incline of your workouts, water bottle holder to place your drinking bottle while working out, and the 2 speed workout fan to keep you cool and fresh especially during those long hard workouts. And finally, the Smooth 6.75 treadmill boasts of lifetime motor and frames warranty, 5 years parts warranty and a 2 years labor warranty. These warranties are defintely better than what similar treadmills offer. So far I don't see any weakness in this machine. But as a reminder, the price of this machine already includes curbside shipping but if you want it to be delivered inside your house you will need to pay extra. 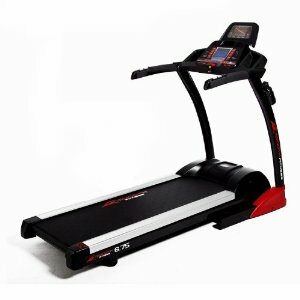 If you plan on buying a Smooth 6.75 treadmill, I suggest you buy directly from the company through smoothfitness.com. They offer the best price around the net. You can get it for just $1,299.